This space wallpaper is a scaled-down version of a full-circle view, which combined nearly 900 images taken by NASA's Curiosity Mars rover. This space wallpaper is a scaled-down version of a full-circle view, which combined nearly 900 images taken by NASA's Curiosity Mars rover. The view is centered toward the south. 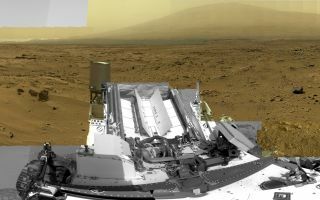 It shows Curiosity at the "Rocknest" site where the rover scooped up samples of windblown dust and sand. Curiosity used three cameras to take the component images on several different days between Oct. 5 and Nov. 16, 2012. This image was released June 19, 2013.